Like any other economic system, such as stocks, bonds, mutual funds or poker, there are a half million books about systems to use and another half million pitchmen selling their personal expertise. It's an industry in to itself, and it can be bewildering for the reader and novice. Each book claims to have the best, purest, cant loose strategy on how to make money with money itself. The problem with reading the claims of a book is the book is in the market of self promotion. No book aimed at the average reader is going to tell you 'This book is full of complex information and highly subjective experience that will require effort on the part of the reader to break apart, distill, learn and understand before any appreciable gain is made'. That doesn't sell books. What sells a book is the illogical and unreasonable approach that this particular book will solve all your problems, teach you the one pure way, part the red sea and drive the clouds away. After reading this book, you will be armed to go toe-to-toe with the professionals who went to college and have spent decades watching market trends and patterns. A favorite tactic of any genre-specific 'how-to' book is to rehash common-sense behaviors, dressed up with industry-specific jargon, taking a single simple concept, overcomplicating it, then 'making it simple' again, showing the expertise of the author. The discerning reader needs to be able to parse through the jingoistic rhetoric and discern, if underneath all the self-promotion, there is something inside the book that will actually be of genuine educational value to the reader. Below we have chosen one of the more popular of the books detailing strategies in the Foreign Exchange Market places, and the blurb they wrote for themselves. The Books Blurb: For commodity traders and portfolio managers--a practical, hands-on guide to profiting in today's growing international cross rate markets. Cross rates trading is growing increasingly popular, fueled in no small part by banks and multinationals seeking creative strategies for hedging currency risk and speculators seeking profits from interest rate plays and exchange rate moves. Trading Currency Cross Rates is the passkey to this vastly profitable financial sector. 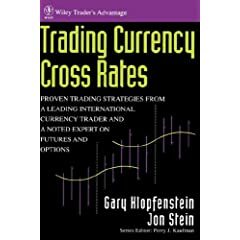 Written for the experienced trader moving into the currency futures and foreign exchange cash markets, as well as for the corporate portfolio manager seeking to limit company exposure, this professional guide covers the fundamentals of today's cross rates markets and delivers the step-by-step techniques needed to trade cross rates successfully. Packed with charts and tables that apply over a broad range of international markets and currencies, the guide.